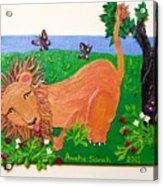 The Lion Who Loves Strawberries by Sarah Swift - 8.000" x 6.000"
The Lion Who Loves Strawberries framed print by Sarah Swift. Bring your print to life with hundreds of different frame and mat combinations. Our framed prints are assembled, packaged, and shipped by our expert framing staff and delivered "ready to hang" with pre-attached hanging wire, mounting hooks, and nails. There are no comments for The Lion Who Loves Strawberries. Click here to post the first comment. 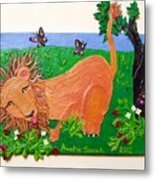 This piece in my safari collection of artwork for children, was done specifically for my little niece. One of her books (in Hebrew) is translated as "The Lion Who Loves Strawberries". 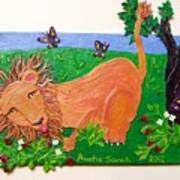 When I started doing the lion collage for her, I was reminded of the book, and this collage became an homage to the book and its own wonderful artwork. I added strawberry plants, and also the lion's tongue, to show his zest for them. The butterflies are purple--my niece's favorite color.